There is no joke in popular saying that “Igbos are what they eat.” It just makes good sense that what we put in our bodies is what reflects in all aspect of our health. A big part of staying healthy and living long life is related to our diet. Good and nutritious food makes us look good and prevents many diseases. There are many nutritious foods that are eaten all over Igboland and by our people. 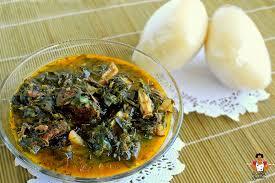 Ofe Owerri is one among several nutritious soups that is mostly consumed in Igboland among our people. This soup stands as a unique dish because of its flavour, method of preparation, nutritive content and its potential therapeutic / medicinal value. From the roadside hawkers to the tables of the elite, it is a welcome meal for festivity. The principal ingredients such as vegetables, meat, snail, periwinkles and stockfish used in the preparation of this soup make a delicious and mouth watering dish. We all know by now that it is important to eat vegetables because of their nutrient content. Vegetables are rich in vitamin C, E, folic acid, vitamin A (beta carotene) and dietary fibre, which are all essential for maintaining good health. Vitamin E has a number of functions and one of these is to act as an antioxidant, which neutralises the effects of free radical that causes cancer and heart diseases. Vitamin A performs the functions to maintain the healthy skin, protect the body from infections and also good for good vision. Apart from nutrients from vegetable, Ofe Owerri is also rich in protein qnd calcium and they are essential in maintaining a healthy living. Regular consumption of this Igbo soup is essential for people wishing to take extra care of their health. It is an ideal food for both children and adolescents for physical growth and development. Pregnant women, nursing mothers can also benefit from this dish for their wellbeing. Convalescing patients can recover quickly from their illness and also build a strong immune system against diseases and infections when they include Ofe Owerri in their diet. Wash the beef and season with onion, one magi cube and salt. Allow to steam till juice dries up. Add 2 cups of water, snail and stockfish, continue cooking till the stockfish is soft and the meat is cooked. Pick, wash and shred the ugu leaves. Add the fish and isam to the meat pot and add the remaining water. Peel and wash the cocoyam. Cut each into two pieces and pot, continue cooking until is cooked. Remove the cooked cocoyam and pound and return to the pot as a thickener. Add the maggi crayfish, pepper and palm oil. Stir thoroughly and reduce the heat. Add the shredded ugu and ukazi leaves. Stir and allow to cook for about 6 minutes. Remove from burner and serve with pounded yam. Common or white yam is a staple food in Igboland. It is rich in carbohydrates in form of starch, B group vitamins, vitamin C and potassium. Pounded yam is a good source of energy because of its carbohydrate content. Pounded yam is highly recommended when there is increase energy demand like during growth, pregnancy, physical strain and for Igbos that are involved strenuous activities. Cut, peel and wash the yam. Put the yam in a pot, add enough water and place the pot on the fire. Boil until the yam is cooked. Pound the yam in a mortar or pounding machine until it is free from lumps and slightly elastic. Mould and serve with Ofe Owerri.